Even on television, the Stadio Delle Alpi of Turin felt like a stadium to which teams were sent to play as punishment. A running track encircled the field, obscuring the view of the crowd by adding unnecessary distance, and the acoustics of the cheering crowd sounded like a riot underwater. The grotesque venue was an architectural conundrum not from any post-modern resistance to defined geometry, but because it left doubt as to whether any planning went into it all. Built in 1990 for the World Cup, the Stadio Delle Alpi failed to attract a sizable crowd on a consistent basis. The stadium could hold about 68,000 spectators, but average attendances for seasons were well below that. The shape of the stadium was certainly a major reason, as were the facts that it was located on the outskirts of the city and that many Juventus fans do not live in Turin (however, it should be noted, even attendances for Torino's games were low). 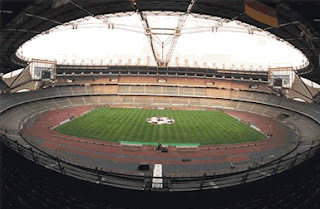 Juventus' coruscating 3-1 victory over Real Madrid in the Champions League semi-final in 2003 was witnessed by an almost capacity crowd, and that remains one of the most memorable nights for the club at the Stadio Delle Alpi. Yet, it was depressing to watch such a liberating performance play itself out in an oppressive cavern. 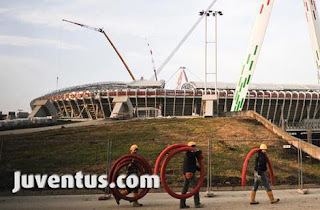 In what will come as good and perhaps old news to some of you, the stadium has been demolished for over two years now, and Juventus, who have been playing at the Stadio Olimpico in Turin, are expected to battle in their new stadium next season. The new stadium is called Juventus Arena for now, and will hold about 40,000 people. It reportedly cost about 120 million euros to build. Though built on the same plot of land as the Stadio Delle Alpi, it will not suffer from the architectural shortcomings of its predecessor. The seating, for example, is much closer to the action. In addition to these improvements, the stadium will also have eight restaurants, four-thousand parking spaces, and an area commemorating the thirty-nine Juventus fans who died at Heysel. The plans for the stadium were announced in November 2008, and the construction took two years to complete. While the stadium itself is not impressive when you compare it to where most clubs in the Bundesliga and the Premier League play, in the context of Italian football it is revolutionary. Juventus are the only club in Serie A to have their own stadium. Clubs like Roma and Milan have talked about one, but there are no firm plans for construction. The private ownership of a stadium should boost Juventus' revenues, for they do not have to pay an annual rent to the city council. The bigger Italian clubs have traditionally relied on TV rights and benefactors to stay competitive in Europe. However, with the Financial Fair Play rules about to take effect, the benefactor factor may dissipate (it remains to be seen how stringently these rules will be enforced), and Juventus seem to be the most prepared team in Serie A for that possibility. They now boast a more diverse financial portfolio, which bolsters chances of competing with the bigger clubs of Europe. Of course, it remains to be seen exactly how much of a success the new stadium will prove to be financially or in terms of popularity with the fans. Yet, surprisingly, there is relatively little discussion about its potential benefits to Juventus. Juventus' main rivals, Inter and Milan, have still not laid out concrete plans to build a new stadium. Milan vice-president Adriano Galliani talked about problems with the San Siro as early as October 2005, claiming that Milan directors had "different ideas" about the stadium than their counterparts at Inter, with whom they share the stadium. He also admitted that it was imperative that "new stadia be built" in the country in general, due to their dilapidated state (stadia have not been extensively renovated since the 1990 World Cup). Not all of it is cynicism. Galliani has been deploring the financial advantages that foreign clubs enjoy for a few years now, but it is Juventus who have taken an effective approach in addressing the growing disparity. In the post-Moggipoli era, Juventus, whether led by former president Giovanni Cobolli Gigli or the current incumbent Andrea Agnelli, seemed to have done little right on the market, and their results on the field have resulted in anguish for their fans. However, the club, nicknamed La Vecchia Signora (The Old Lady), has shown a penchant for the modern by pioneering with a new stadium. The late Juventus and FIAT head Umberto Agnelli once said that the Bianconeri "have followed the evolution of the nation," referring in part to how inextricably linked the team became to FIAT, a symbol and register of the Italian economy for decades. Now, it seems Juventus is also creating a revolution in the nation.